Huawei unveiled its latest laptop, the MateBook 13, at Mobile World Congress back in February. I had the chance to test the ‘Space Grey’ variant of the notebook over the past few weeks. While the laptop doesn’t include a pop-up camera, it does feature an elegant design and premium feel. 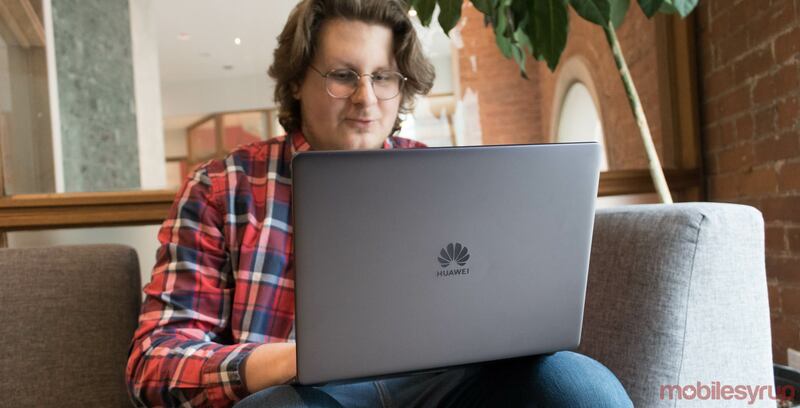 People often mistook the laptop for a MacBook, which is both a compliment and exactly what Huawei wants. 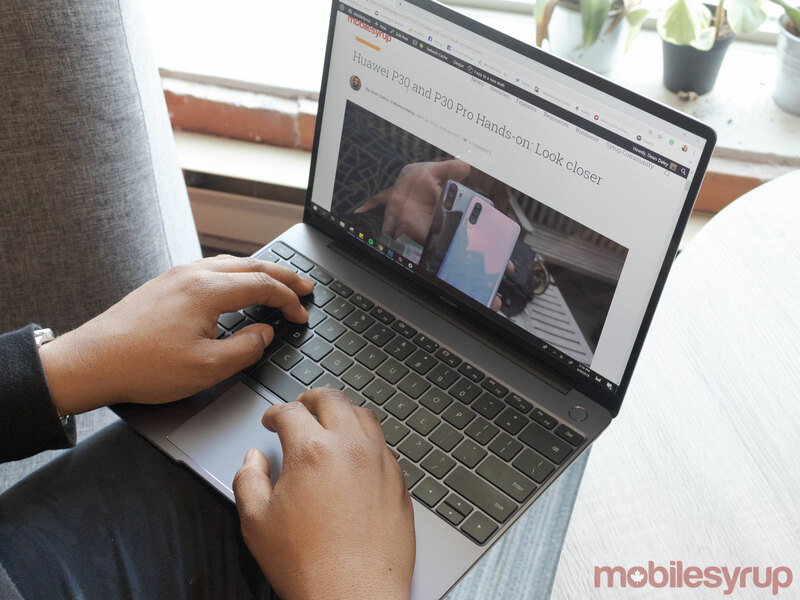 While the laptop, unfortunately, features issues that I’ll discuss later in this story, for the most part, I enjoyed my time with the MateBook 13. That said, there isn’t anything particularly mindblowing about the laptop, but altogether it’s a solid device. At 14.9mm thick when folded, the MateBook 13 is a thin laptop. The MateBook 13 is thinner than the MacBook 2019 MacBook Air, which measures in at 15.6mm. However, its thinness is deceptive because once you pick it up, you’ll likely be shocked by the laptop’s weight. Weighing in a 1.3kg, there’s a surprising amount of heft to the laptop considering its size and thinness. And if you’re wondering, yes, it is heavier than the 2018 MacBook. But that’s not to say the laptop felt too weighty though. For example, I was easily able to take pictures of it with a camera in one hand while holding it with the other. It just looks heavier than you’d expect for such a thin and compact notebook. Dimensions wise, the MateBook 13 measures in at a width of 296mm and a height of 211mm. Even though the MateBook 13 is made of plastic, it still feels sturdy and well-built. While a weighty laptop isn’t typically a good thing, I’d argue the additional heft gives the MateBook 13 a more premium feel. The thin laptop also comes with a few downsides. Port-wise the MateBook 13 only sports two USB Type-C ports with a single 3.5mm headphone jack. This means that if you’re interested in purchasing this device, get ready to embrace the #donglelife. 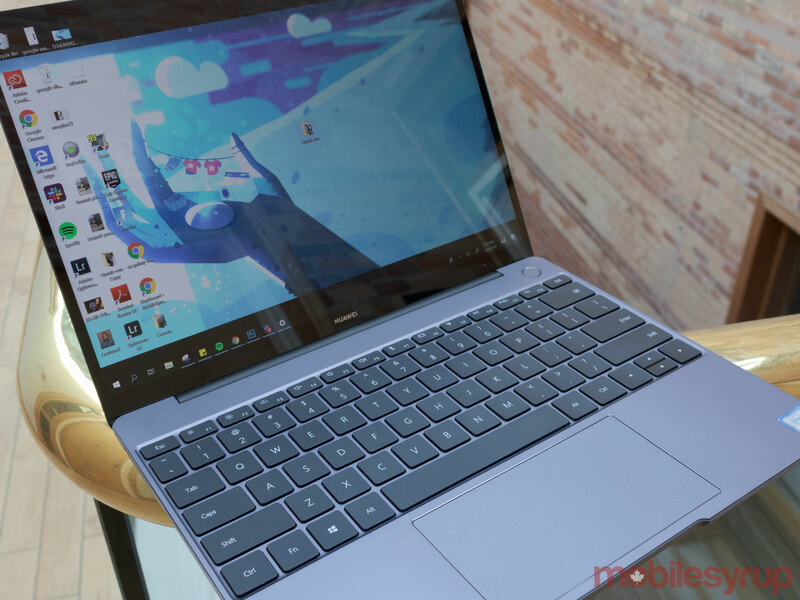 The speakers face downwards, and though they are loud, I would have preferred it if Huawei placed them at the top of the laptop. That said, the speakers do feature Dolby Atmos surround sound technology. And as I previously mentioned, the laptop doesn’t include a pop-up camera like the MateBook X Pro. Instead, the 1-megapixel camera is located on the top bezel like most other laptops. Huawei placed the power button above the delete key, which also doubles as a fingerprint scanner. 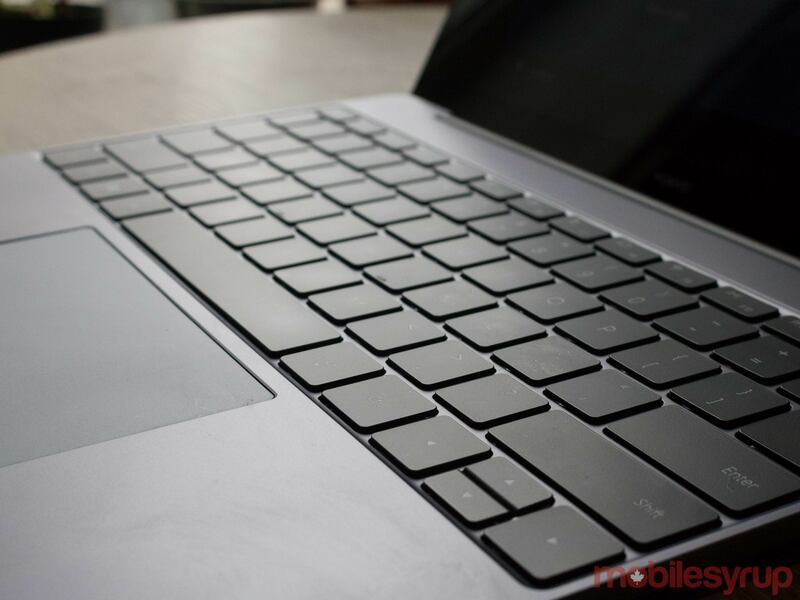 The MateBook 13 features black keys with a full backlit keyboard. The keys felt great — they’re big and have good travel. The laptop sports a 1.2mm key distance. As a result, when typing the keys have the right amount bounce to them. I compared the keys to the MacBook 2017 and I thought the MacBook’s were far shallower. 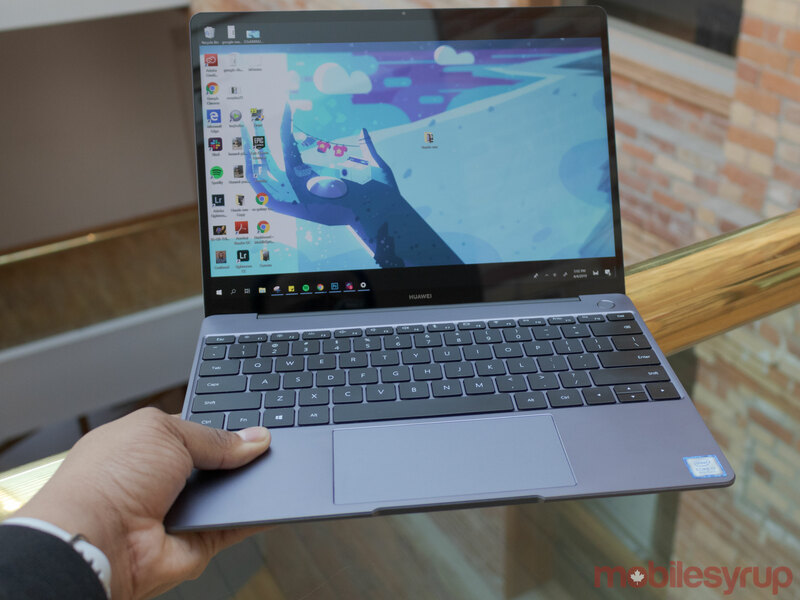 The MateBook 13 that I tested features an Intel Core i7 8565U Coffee Lake processor with 8GB of RAM and a NVIDIA GeForce MX150 graphics card. With that internal hardware in mind, the laptop runs smoothly without any lag, just as I expected. Over a regular day, I used apps like Adobe Photoshop, Chrome, Spotify and Slack. While I didn’t experience any issues most of the time, I did have problems with Lightroom. Sometimes loading up multiple images at once would cause the MateBook to chug and run hotter. In those instances, when the MateBook completed importing the RAW files from my camera, the experience went back to smooth sailing. I also tried playing Fortnite for roughly 20 minutes. During this time the laptop got very hot with the game running at 24fps. While the MateBook 13 was able to handle Fortnite pretty well, I wouldn’t suggest running it under a heavy load for an extended period because it could overheat. This means that graphical intensive games like Overwatch or The Witcher 3 are probably out of the question. If you’re interested in playing those types of games on a laptop, you’re likely better off picking up a gaming-specific laptop. At times, the MateBook’s fans also got loud. This happened when I played Fortnite, and when I was writing part of this hands-on. In the latter case, all I had running at the time was Google Chrome (with two tabs open), Spotify (with no music playing) and Slack. This was a rare occurrence, but it’s important to note that the fans do occasionally seem to spin up for no reason. As I previously mentioned, the laptop’s fingerprint scanner doubles as the power button. I thought this was a clever move on Huawei’s part because it easily allows you to wake the computer from hibernation and log in simultaneously. This works the same as it does with the MacBook Pro and MacBook Air, so it isn’t exactly unique. Still, it’s a welcome addition. Just like with a smartphone, the fingerprint scanner unlocks the computer instantly with the help of ‘Windows Hello.’ When you’re booting up the notebook and it’s powered off, you’ll still need to tap your finger against the fingerprint scanner to unlock the device. 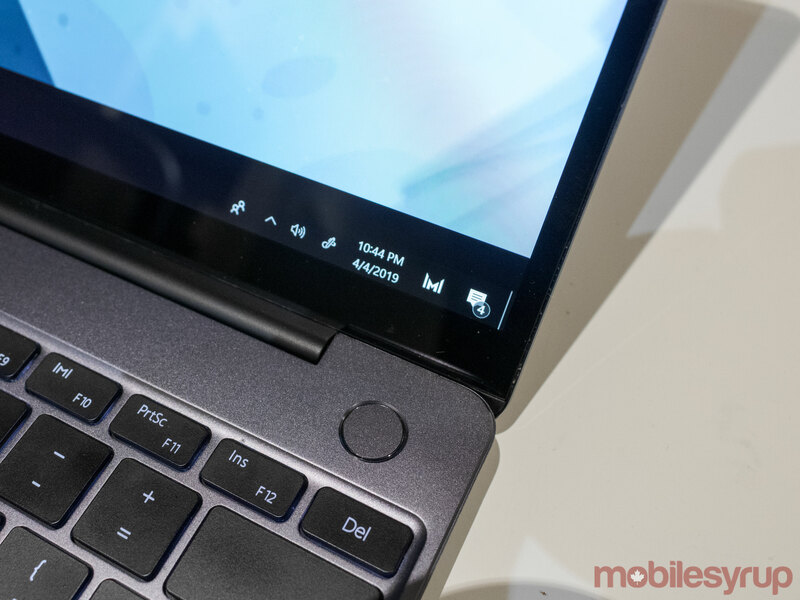 I think this is a good implementation of a fingerprint sensor in a laptop because it saves a lot of time. It sort of reminds me of LG’s G6 smartphone, which featured a fingerprint scanner in its rear-facing power button. As for the battery, the Huawei MateBook 13 features a 41.8 Wh power source. When I used the laptop, I often had Spotify, Slack, Photoshop and Chrome running in the background. Also, I set the display to half brightness and the computer to its best battery performance setting. With these settings, I got a little over six hours of battery life. When I adjusted the display to its maximum brightness performance settings, I got at most three hours of usage. Even though the Dolby Atmos speakers are downward facing, they’re still quite loud and can easily fill a room. Even when placing the laptop flat against the table, the speakers don’t get muffled and nearly sound the same in comparison to when they’re not blocked by a table. The laptop’s speakers aren’t the loudest for a notebook. I compared the MateBook 13’s speakers to Apple’s 2016 MacBook. The older MacBook offered a more full sound stage and more pronounced bass. In comparison, the MateBook 13’s speakers are a little tinnier hollow sounding, which is odd considering the Dolby Atmos branding. 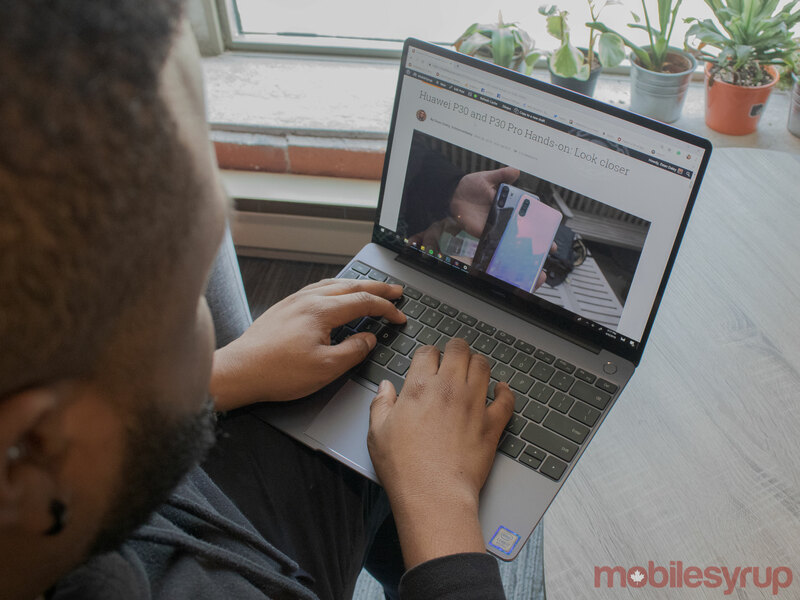 The MateBook 13 is a good laptop, and while its battery isn’t the best, it provides decent sound, can handle my day-to-day tasks and it features a sleek design. I also really like the placement of the power button because it doubles as a fingerprint scanner. The laptop’s key travel is also superb, and I appreciate the display’s quality even though it isn’t 4K. This isn’t the most impressive laptop on the market from Huawei but it is the most affordable. 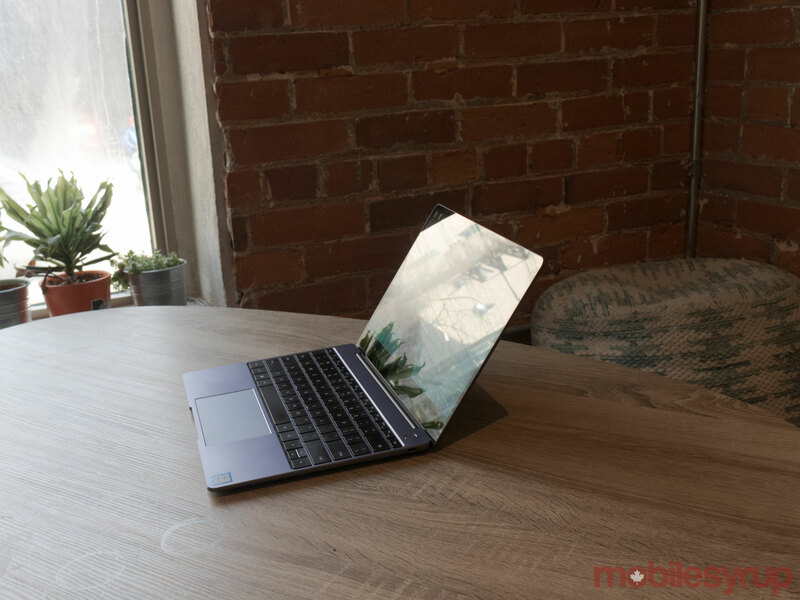 The China-based company’s new MateBook X laptop is currently available in Canada and can be purchased through Amazon for $1,369.89 CAD.